The Christmas season is usually a fruitful time for receiving car-related gadgets from well meaning relatives. Who hasn't got a collection of wonky Chinese hand tools and frightful seat covers carefully hidden in their garage? What about cans of weird looking car polishes you wouldn't dare to use on a Datsun 120Y - even for a bet? Any manner of strange, bendy things with magnets on the end, intended to retrieve things you dropped in your crankcase? I'll relate them in chronological order so you might get some idea of the evolution of the oil filter wrench in the Sophisticated household. The first oil filter removal device I ever used I borrowed. I was a total mechanical neophyte, attempting to save twenty dollars by changing the oil in my old student car, and had enlisted a more mechanically minded friend, Pete, to show me how. Thanks to his father, said friend had a collection of tools in the shed. (He owned a Kombi; you have to have tools if you own a Kombi.) Out of this wondrous collection, he produced quite the strangest looking wrench I had ever seen - a chain wrench that looked more suited to a biker fight than working on a car. I instinctively flinched, but he reassured me that its primary purpose wasn't re-creating The Wild One, although his father wasn't averse to flailing away with it at the Kombi when it wasn't running, which was often. He handed the wrench to me, explained which way the oil filter should come off, and stood back with arms folded. Once wrapped around the offending oil filter, the wrench's lever supposedly enabled you to twist the oil filter off with a simple flick of the wrist. In practice, it was a very efficient device for crushing the oil filter neatly in half, without twisting it a single degree. Pete scratched his head and produced a huge screwdriver and hammer. He proceeded to bash the screwdriver through the filter with the hammer, then twisted the screwdriver and the filter was removed without further delay. Being somewhat inexperienced at the time, I questioned the point of crushing the filter before removing it, but he threatened me with the chain wrench, so I accepted it as normal practice. A year later, having learned that crushing the filters wasn't a necessity to be completed prior to their removal, I happily skipped out to the garage with a Christmas present that consisted of a flimsy piece of nylon webbing attached to a metal post. The manufacturer wasn't quite proud enough to put his mark on this device - so I have no idea which country it came from - or for that matter, whether anybody had tried the idea before committing to manufacturing it. The metal post had a half-inch socket drive intended to allow the webbing strap to be tightened around the body of an oil filter, eventually becoming so tight that the twisting action removed the filter. Next Christmas? I requested a proper, metal strap oil filter wrench just like professionals use. No rubbish, a good one. Proudly manufactured by T&E Tools of Chicago, Illinois, with USA emblazoned on several surfaces, it couldn't be anything else but fabulous. And fabulous it is, with a nice cushioned handle and good quality steel fittings. It's the F150 of oil filter wrenches, built strong enough to turn the entire engine over if you desired. New filter in hand, post Christmas oil change looming, I marched out to the garage with my shiny new toy and gleefully placed it over the body of the two centimetre too small oil filter. Even at full stretch, the metal strap wouldn't even go close to touching the sides of the filter. It wasn't adjustable, either. Obviously designed for something with a man-sized filter, my effete wheels didn't measure up. Aghast, I reached for the trusty screwdriver and hammer and with practiced hand, speared the filter with a single blow and twisted it off. Let's skip forward to Christmas 2000. It's dot-com boom time and I wanted a nice, high-technology oil filter removal device that was guaranteed to be the right size, not slip off or to be made out of junk. I'm handed a massive, claw-like, three-pronged, gear-driven filter remover that looks like it could tear the filter, oil pump and crankshaft directly out of your motor before you blinked. H.R. Geiger couldn't draw anything as menacing as this thing. If you think the glop-covered mouth parts of those Alien creatures look scary, you obviously have never set eyes on the patented "Two Way Oil Filter Wrench", proudly manufactured in the USA by ex-military engineers more used to designing weapons of mass destruction. When I entered the garage, I self-consciously hid the device behind my back, afraid of frightening the car. 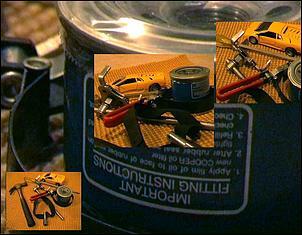 Gingerly, I lowered the sinister claw into the engine bay and attempted to place it over the back of the oil filter. No dice. Not enough clearance at the back for claws to fit. It needs at least five centimetres of room and I had less than two. No matter which way it was turned or twisted, the only thing I managed to remove was bits of my fingers. Hammer and screwdriver time again. Where can I go from here? Over the years, I've used tools that can crush a filter, polish it to a fine sheen, frame it, or scratch it helplessly around the nether regions. Mostly, I didn't want to do any of these things, I just wanted to get the damn' thing off the engine. With this motley collection of tools arrayed before me, I decided to settle the problem once and for all.